As you may have guessed, this involved adult versions of typical kids’ field day activities, such as 3-legged races, wheelbarrow races, and sack races. As you may not have guessed, each of these races also involved bananas, because it was a field day for charity to raise money for cancer research, and for some reason–no one knows what–the event is affiliated with bananas. I love variety in food. I love candy, and chocolate, and carbs, and ice cream. I hate the idea of restricting myself from the things I love. I’m not used to paying careful attention to what I eat. So I have my work cut out for me. In theory, it sounds good. It sounds like it should be delicious. And at first taste, it is, a little. But it’s also weirder than you thought it would be. There’s something not-quite-right about the taste, but you can’t say exactly what it is. Bananas and chocolate–these things generally go together. 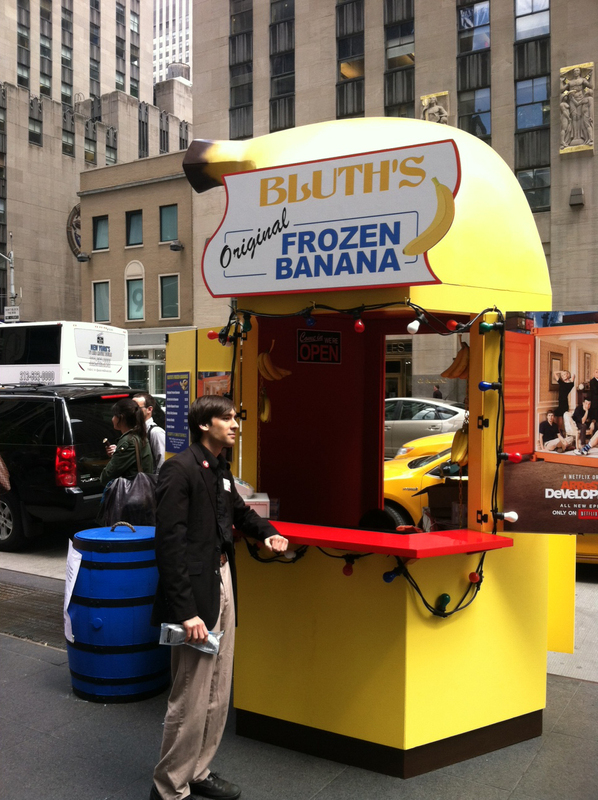 The Bluths made a whole business out of the combination. So this should work. It shouldn’t have this strange layer to the flavor that makes you want to wince. It should be easy to drink. It should go down smoothly. Yes, we are getting to the point in the year when I’m running out of new things to do so every other one is food-related. The good news is that means I get to try a lot of new foods. The bad news is–wait, there is no bad news…except maybe if my readers get tired of reading about food, but 1.) then they can just stop reading, and 2.) who gets tired of reading about food? Although I am gullible, when I hear something outrageous or unbelievable, my first reaction is to assume the person is joking. Spoiler alert: “Everyone” was 3 people, including me. It was a beautiful 50 degree day. The sun was shining, the sky was a brilliant blue, and did I mention it was 50 degrees? Apparently, 50 degrees is fairly cool. Yet for some reason, I thought it meant I should wear a light, spring jacket and a short-sleeved shirt to go on a walk in a windy area near a lake. Spoiler alert: It did not mean that.